Greater Sage-Grouse are thought to return to the same breeding ground, or "lek," every spring—but how do populations avoid becoming isolated and inbred? A new study from The Condor: Ornithological Applications used thousands of DNA samples collected at leks across four states to reveal that some sage-grouse travel more widely than anyone suspected and, in doing so, may temper inbreeding and isolation. Using genetic markers in DNA extracted from feather and blood samples, Todd Cross of the U.S. Forest Service Rocky Mountain Research Station and his colleagues identified more than three thousand individual sage-grouse that visited leks across the northeastern portion of the birds' range over seven years. Approximately two and one-half percent of birds in the sample turned up twice, a mixture of individuals returning to the same lek in different years, visiting different leks within one year, or visiting different leks in different years. Seven birds made movements of over 50 kilometers (over 30 miles), six of which occurred within a single breeding season. The study used 7,629 samples collected from 835 leks in Idaho, Montana, and North and South Dakota between 2007 and 2013. While the results support the idea that most grouse are faithful to their chosen lek sites, some individuals clearly make long-distance movements, which could help prevent inbreeding within leks and expand the size of the genetic neighborhood. "Our research demonstrates that Greater Sage-Grouse are an even more mobile species than we had realized before, moving large distances of up to 194 kilometers—over 120 miles—in a single breeding season," says Cross. "These findings highlight the importance of landscape-scale efforts that conserve movement corridors." 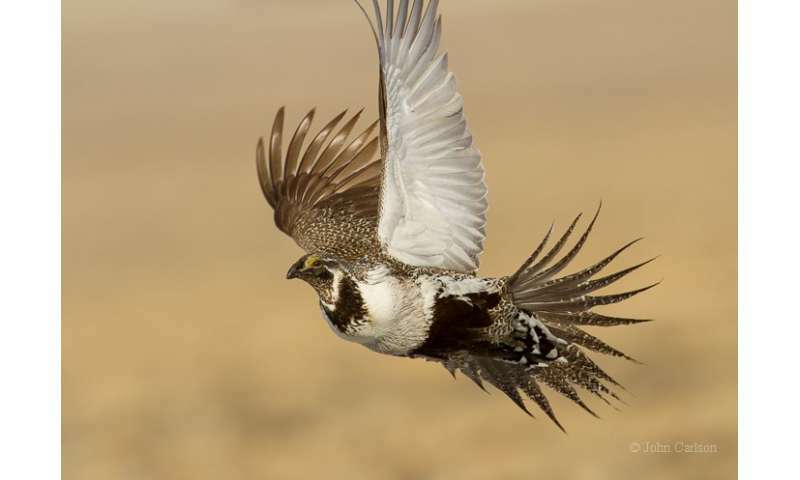 "The use of genetic recapture information opens an exciting new door to understanding the landscape dynamics of the Greater Sage-Grouse," according to Pat Deibert, National Sage-Grouse Conservation Coordinator for the U.S. Fish and Wildlife Service. "Species conservation is more than tracking the number of individuals: We also have to understand how a species uses the landscape and the associated impacts on their vital rates. The data presented in this paper provide additional insight to effective landscape management and conservation design for the Greater Sage-Grouse and will contribute to the continual improvement of management for this species."